Spring is the time for trimming, clean ups and mulch ! Contact Us now for clean-ups, discounts on mulch and discounts on trees. Or use our online form to request an estimate. 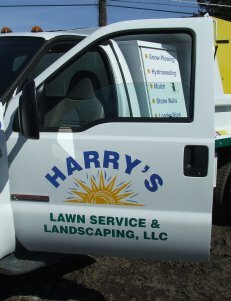 Harry's Lawn and Landscaping LLC. Harry's Lawn and Landscaping is a full-service commercial and residential landscape company. We pride ourselves on reliability and quality control in order to maintain a unique and quality environment for our clients. Harry has 25 years experience in the Landscape and Green Industry. Harry is a Certified Landscape Manager through Rutgers University, Cook College. Harry also Holds ICPI Certification for installation of paver patios and stone walls. He is also a member of the New Jersey Farm Bureau. Implementing the latest technologies of the industry with the use of the digital landscape design process, our clients can view the final products before we ever physically touch their yard. Come on in to our testimonial section and see what are clients are saying about the quality of our work and service. You can also submit your own testomial about Harry's Lawn and Landscaping.